Vote For Me has an unfortunate sense of timing. Coming after two months of British election fever, it plays to a country that's sick to death of political argument. Compounding matters is the unfortunate fact that for most Londoners, the election was a profoundly depressing occasion in which scum-sucking evil bastards received a mandate to ramp up their plans. It's even badly timed for US politics, coming even before candidates have been selected for the 2016 campaign. Compounding this is that the show was first performed in 2010 at the New York Musical Theatre Festival - making it ever-so-slightly politically out-dated. All this added up to a performance where the cast easily outnumbered the audience. 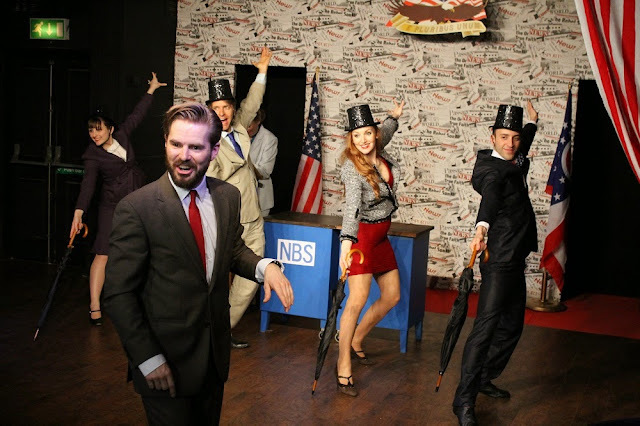 Drew Fornarola and Scott Elmegreen's production reimagines a US Presidential debate as musical. We look on as thecandidates, Democrat Janet Tilghman (Emily Lynn) and Republican Buddy Rounsaville (Hans Rye), slug it out to win the most powerful job in the world. Backing them up are their partners; Buddy's wife Amy (Jennie Jacobs); and Janet's husband Roger (Arvid Larsen). Scurrying around in the background is a scummy spin doctor (Joe Leather), who flips a noteboard over as he switches sides, and the host of the debate -the cool but frustrated Robyn Fiedler (Lucy Grainger). 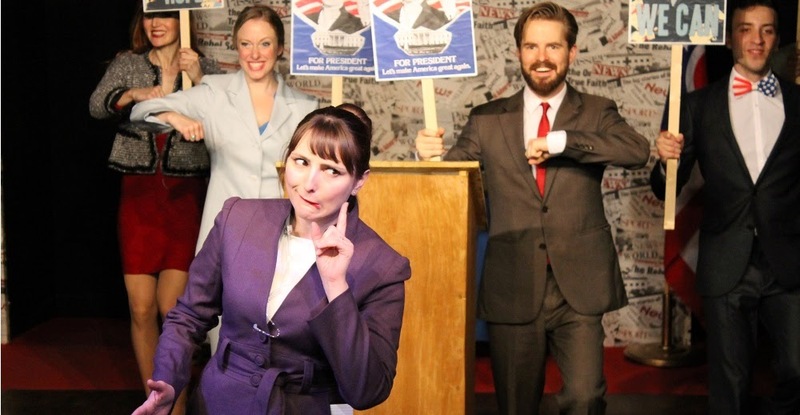 The show reward an intimate knowledge of US political trivia. I've always enjoyed following US politics and particularly their presidential campaigns - loving the histrionic barminess and usage of every dirty trick in the political handbook is deployed. So, the cast sing about the ACORN scandal, Reverend Wright's support of Barack Obama and the Benghazi controversy. You don't have to be a complete politics nerd to fully appreciate this blizzard of references, but nonetheless, going in blind would be a daunting prospect (though the programme does supply a glossary). Soon, the show settles into a rhythm of light, bipartisan satire. So, the Hillary Clinton-esque Democrat is presented as a spend-happy, socially conscious politi-nerd with naive foreign policy goals. The Republican is a good-looking Romney-esque dimwit prodded towards candidacy by a power-hungry wife. He's so vacuous that he needs a lengthy binder that keeps track of what his opinions are. It'd have been real easy to make the Republican a straight up supervillain, but Buddy Rounsaville quickly comes across as broadly and strangely sympathetic. Hans Rye, in a wonderful performance, effortlessly switches gears between a grinning, plasticated game show host and the paranoid man underneath, victim to a pushy wife and a ravenous party machine that will stop at nothing - nothing - to see him elected. By comparison, the Democratic candidate written is a touch more two dimensional; her struggle is one of confidence - the geek paranoid that she'll never win the approval of the cool kids. Lynn's performance captures the eager swottiness of someone who is absolutely sure they have the right solution and will explain why at great length. The climax of the show is the audience choosing between each of these candidates - then forking into two possibilities. Frankly I'd be surprised if the Republican candidate ever won this battle - a metropolitan theatre-going audience isn't exactly the right crowd to pick a warmongering, anti-abortion maroon (even a fictional one). But this potentially interesting dramatic device ended up a damp squib when I attended - it's hard to build tension when there's just five people voting. That aside, at 90 minutes the show feels a touch bloated. I can't fault the impressive number VOTE! (For Me), in which Grainger's disgruntled debate moderator performs an impressive act of memorisation in listing the 139 countries that have higher voter turn-out levels than the US, but narratively it's wheel spinning and the politically it's rather simplistic. Worse, as the minutes tick on, the backroom dealings threaten to descend into soapy melodrama. A nagging sensation grows: the idea of a musical presidential debate is a good one, but perhaps one that'd work better pared back into an hour - or even 45 minute - show. Vote For Me is a difficult to show to genuinely dislike; it's performed with energy, skill and there's an obvious love of politics at its core. But it's a bit flabby around the edges and lacks bite, especially in comparison to contemporary political satires like The Thick of It/In The Loop and Veep. Admittedly it would have most likely have worked better with an audience above single digits, but them's the breaks. Vote For Me is at the Eel Brook until the 23rd of May. Tickets here.